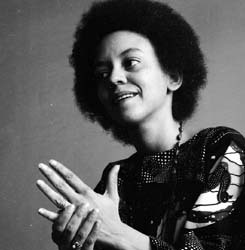 Nikki Giovanni first gained national prominence during the late 1960s and has remained a popular poet over four decades now. She is arguably one of the most successful living African American poets. During the black arts era, Giovanni became one of the more iconic figures of the black arts movement. In addition to the wide circulation of her poetry, Giovanni appeared on television programs; her image frequently appeared in magazines; and she spoke at more than two hundred events each year during the early 1970s. Appraisals of the black arts movement that describe it as an all-male enterprise do not account for the powerful influence and popularity of writers such as Carolyn Rodgers, Sonia Sanchez, and certainly Nikki Giovanni. Although writers such as Amiri Baraka, Haki Madhubuti, Larry Neal, Hoyt Fuller, and Dudley Randall did hold important places, Giovanni was also an essential poet and cultural figure. First self-publishing then publishing with the black-owned publisher Broadside Press and finally securing a deal with a major publisher -- William Morrow and Co. - Giovanni was a vital connective force, linking large groups of readers with black arts discourse. Her albums featuring poetry such as Truth Is On Its Way (1971), Like A Ripple On A Pond (1973), and The Way I Feel (1975) extended the idea of black arts poets producing mixed media work and made African American verse available to a wider range of audiences.